I'm a Professor at the School of Information and Library Science at the University of North Carolina at Chapel Hill. I teach archival administration; records management; digital curation; understanding information technology for managing digital collections; and acquisition of digital data from physical media. My primary area of research is the long-term curation of digital collections. I'm particularly interested in the professionalization of this work and the diffusion of existing tools and methods (e.g., digital forensics, web archiving, automated implementation of policies) into professional practice. For the official summary of what I do and have done, you can see my Curriculum Vitae (CV). Chassanoff, Alexandra, Kam Woods and Christopher A. Lee. “Digital Preservation Metadata for Disk Image Access.” In Digital Preservation Metadata for Practitioners: Implementing PREMIS. Edited by Angela Dappert, Rebecca Squire Guenther, and Sébastien Peyrard, 99-109. Cham: Springer, 2017. Lee, Christopher A., Suzie Allard, Nancy McGovern, and Alice Bishop. “Open Data Meets Digital Curation: An Investigation of Practices and Needs.” International Journal of Digital Curation 11, no. 2 (2016): 115-125. Christopher A. Lee, Suzie Allard, Alice Bishop, and Nancy McGovern. Open Data Meets Digital Curation: An Investigation of Practices and Needs. In Proceedings of the 11th International Digital Curation Conference, 2016. Christopher A. Lee, Jonathan Crabtree, Leo Konstantelos, Nancy McGovern, Yukio Maeda, Maureen Pennock, Helen Tibbo, Kam Woods, and Eld Zierau, eds. Proceedings of the 12th International Conference on Digital Preservation. Chapel Hill, NC: University of North Carolina, School of Information and Library Science, 2015. Woods, Kam, Christopher Lee, Oleg Stobbe, Thomas Liebetraut and Klaus Rechert. “Functional Access to Forensic Disk Images in a Web Service.” In Proceedings of the 12th International Conference on Digital Curation, edited by Christopher A. Lee, Jonathan Crabtree, Leo Konstantelos, Nancy McGovern, Yukio Maeda, Maureen Pennock, Helen Tibbo, Kam Woods, and Eld Zierau, 191-195. Chapel Hill, NC: University of North Carolina, School of Information and Library Science, 2015. Lee, Christopher A., Porter Olsen, Alexandra Chassanoff, Kam Woods, Matthew Kirschenbaum, and Sunitha Misra. “From Code to Community: Building and Sustaining BitCurator through Community Engagement.” September 30, 2014. Misra, Sunitha, Christopher A. Lee, and Kam Woods. “A Web Service for File-Level Access to Disk Images.” Code4Lib Journal 25 (2014). Lee, Christopher A. “Up Close and Personal: Individual Digital Traces as Cultural Heritage and Discovery through Forensics Tools.” In Proceedings of PATCH, February 24, 2014, Haifa, Israel. New York, NY: Association for Computing Machinery, 2014. Lee, Christopher A., Kam Woods, Matthew Kirschenbaum, and Alexandra Chassanoff. "From Bitstreams to Heritage: Putting Digital Forensics into Practice in Collecting Institutions." September 30, 2013. Poole, Alex H., Christopher A. Lee, Heather L. Barnes, and Angela P. Murillo. “Digital Curation Preparation: A Survey of Contributors to International Professional, Educational, and Research Venues.” UNC SILS Technical Report 2013-01. April 15, 2013. Lee, Christopher A. "Archival Application of Digital Forensics Methods for Authenticity, Description and Access Provision." In Proceedings of the International Council on Archives Congress, Brisbane, Australia, August 20-24, 2012. Lee, Christopher A., and Kam Woods. "Automated Redaction of Private and Personal Data in Collections: Toward Responsible Stewardship of Digital Heritage." In Proceedings of Memory of the World in the Digital Age: Digitization and Preservation: An International Conference on Permanent Access to Digital Documentary Heritage, 26-28 September 2012, Vancouver, British Columbia, Canada, edited by Luciana Duranti and Elizabeth Shaffer, 298-313: United Nations Educational, Scientific and Cultural Organization, 2013. Lee, Christopher A. "Archival Application of Digital Forensics Methods for Authenticity, Description and Access Provision." Comma 2, no. 14 (2012): 133-139. Lee, Christopher A. “Digital Curation as Communication Mediation.” In Handbook of Technical Communication, edited by Alexander Mehler, Laurent Romary, and Dafydd Gibbon, 507-530. Berlin: Mouton De Gruyter, 2012. Lee, Christopher A. and Helen Tibbo. "Preparing for Digital Curation Governance: Educating Stewards of Public Information." In Proceedings of the Sixth International Conference on Theory and Practice of Electronic Governance, Albany, New York, United States, 22-25 October 2012, 171-174. Edited by J. Ramon Gil-Garcia, Natalie Helbig, and Adegboyega Ojo. New York, NY: Association for Computing Machinery, 2012. Marchionini, Gary, Christopher A. Lee, Heather Bowden, and Michael Lesk. “Curating for Quality: Ensuring Data Quality to Enable New Science.” Final Report on an Invitational Workshop Sponsored by the National Science Foundation, September 10-11, 2012, Arlington VA.
Ruusalepp, Raivo, Christopher A. Lee, Bram van der Werf, and Matthew Woolard. "Standards Alignment." In Aligning National Approaches to Digital Preservation, edited by Nancy Y. McGovern, 115-65. Atlanta, GA: Educopia Institute, 2012. Tibbo, Helen R. and Christopher A. Lee. “Closing the Digital Curation Gap: A Grounded Framework for Providing Guidance and Education in Digital Curation.” In Proceedings of Archiving 2012 (Springfield, VA: Society for Imaging Science and Technology, 2012), 57-62. Lee, Christopher A. “Digital Forensics Meets the Archivist (And They Seem to Like Each Other).” Provenance 30 (2012): 3-7. Lee, Christopher A. “States of Sustainability: A Review of State Projects funded by the National Digital Information Infrastructure and Preservation Program (NDIIPP).” Report to the U.S. Library of Congress. March 2012. Lee, Christopher A., and Helen Tibbo. "Where's the Archivist in Digital Curation? Exploring the Possibilities through a Matrix of Knowledge and Skills." Archivaria 72 (2011): 123-68. Lee, Christopher A. and Kam Woods. “Digital Acquisition Learning Laboratory: A White Paper.” November 2011. Lee, Christopher A. "A Framework for Contextual Information in Digital Collections." Journal of Documentation 67, no.1 (2011): 95-143. Woods, Kam, Christopher A. Lee, and Simson Garfinkel. “Extending Digital Repository Architectures to Support Disk Image Preservation and Access.” In JCDL '11: Proceeding of the 11th Annual International ACM/IEEE Joint Conference on Digital Libraries, 57-66. New York, NY: ACM Press, 2011. Woods, Kam, Christopher A. Lee, Simson Garfinkel, David Dittrich, Adam Russell, and Kris Kearton. “Creating Realistic Corpora for Forensic and Security Education.” In Proceedings of the ADFSL Conference on Digital Forensics, Security and Law, 123-24. 2011. Lee, Christopher A. "Computer-Supported Elicitation of Curatorial Intent." In Dagstuhl Seminar Proceedings 10291, Automation in Digital Preservation, edited by Andreas Rauber, Jean-Pierre Chanod, Seamus Ross, and Milena Dobreva. 2010. Foscarini, Fiorella, Yunhyong Kim, Christopher A. Lee, Alexander Mehler, Gillian Oliver, and Seamus Ross. "On the Notion of Genre in Digital Preservation." In Dagstuhl Seminar Proceedings 10291, Automation in Digital Preservation, edited by Andreas Rauber, Jean-Pierre Chanod, Seamus Ross, and Milena Dobreva. 2010. Lee, Christopher A. "Move It or Lose It: Investigating Digital Curation Portability for Access to Government Information." In Archiving 2010: Final Program and Proceedings, June 1-4, 2010, Den Haag, The Netherlands, 7-12. Springfield, VA: Society for Imaging Science and Technology, 2010. Lee, Christopher A. "Open Archival Information System (OAIS) Reference Model." In Encyclopedia of Library and Information Sciences, Third Edition, edited by Marcia J. Bates and Mary Niles Maack, 4020-4030. Boca Raton, FL: CRC Press, 2009. Tibbo, Helen R., Carolyn Hank, Christopher A. Lee, and Rachael Clemens, eds. Proceedings of DigCCurr2009: Digital Curation: Practice, Promise, and Prospects. Chapel Hill, NC: University of North Carolina, School of Information and Library Science, 2009. Tibbo, Helen R., and Christopher A. Lee. "Convergence through Capabilities: Digital Curation Education for Libraries, Archives and Museums." In Archiving 2010: Final Program and Proceedings, June 1-4, 2010, Den Haag, The Netherlands, 53-57. Springfield, VA: Society for Imaging Science and Technology, 2010. Lee, Christopher A., Richard Marciano, Chien-yi Hou, and Chirag Shah. "Mainstreaming Preservation through Slicing and Dicing of Digital Repositories: Investigating Alternative Service and Resource Options for ContextMiner Using Data Grid Technology." In Proceedings of the Sixth International Conference on Digital Preservation (iPRES), San Francisco, California, October 5-6, 2009, 113-20: California Digital Library, 2009. Marchionini, Gary, Chirag Shah, Christopher A. Lee, and Robert Capra. "Query Parameters for Harvesting Digital Video and Associated Contextual Information." In Proceedings of the 9th ACM/IEEE-CS Joint Conference on Digital Libraries, 77-86. New York, NY: ACM Press, 2009. Lee, Christopher A., Richard Marciano, Chien-yi Hou, and Chirag Shah. "From Harvesting to Cultivating: Transformation of a Web Collecting System into a Robust Curation Environment." In Proceedings of the 9th ACM/IEEE-CS Joint Conference on Digital Libraries, 423. New York, NY: ACM Press, 2009. Lee, Christopher A. "Curation Junction, What's your Function? Defining What it Means to Do Digital Curation in Order to Teach It." In Proceedings of the 2009 Annual Conference of the Association for Library and Information Science Education (ALISE). Marchionini, Gary, Helen Tibbo, Christopher A. Lee, Paul Jones, Robert Capra, Gary Geisler, Terrell Russell, Chirag Shah, Laura Sheble, Sarah Jorda, Yaxiao Song, Dawne E. Howard, Rachael Clemens, and Brenn Hill. VidArch: Preserving Video Objects and Context, Final Report. UNC SILS TR-2009-01. June 12, 2009. Lee, Christopher A., Robert Capra, Rachael Clemens, and Laura Sheble. "I Know It's Important, But What Am I Looking At? Strategies for using Blog Content to Contextualize YouTube Videos." Proceedings of the Second Annual Society of American Archivists Research Forum. Chicago, IL: Society of American Archivists, 2008. Van Diessen, Raymond J., Barbara Sierman, and Christopher A. Lee. "Component Business Model for Digital Repositories." In Proceedings of the Fifth International Conference on Digital Preservation (iPRES), London, England, September 29-30, 2008. Tibbo, Helen R., Carolyn Hank, and Christopher A. Lee. "Challenges, Curricula, and Competencies: Researcher and Practitioner Perspectives for Informing the Development of a Digital Curation Curriculum." In Archiving 2008: Final Program and Proceedings, June 24-27, 2008, Bern, Switzerland, 234-238. Springfield, VA: Society for Imaging Science and Technology, 2008. Capra, Robert, Christopher A. Lee, Gary Marchionini, Terrell Russell, Chirag Shah, and Fred Stutzman. 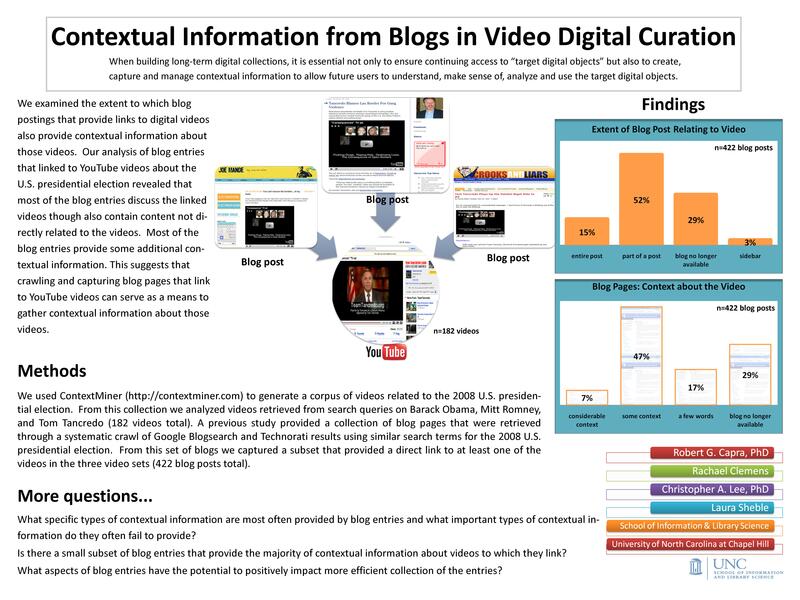 "Selection and Context Scoping for Digital Video Collections: An Investigation of YouTube and Blogs." In JCDL 2008: Proceedings of the 8th ACM/IEEE Joint Conference on Digital Libraries: Pittsburgh, Pennsylvania, June 15-20, 2008, edited by Ronald L. Larsen, Andreas Paepcke, José Luis Borbinha and Mor Naaman, 211-20. New York, NY: ACM Press, 2008. Lee, Christopher A., Helen R. Tibbo, and John C. Schaefer. "Defining What Digital Curators Do and What They Need to Know: The DigCCurr Project." In Proceedings of the 2007 Conference on Digital Libraries, 49-50. New York, NY: ACM Press, 2007. Lee, Christopher A., Helen R. Tibbo, and John C. Schaefer. "DigCCurr: Building an International Digital Curation Curriculum & the Carolina Digital Curation Fellowship Program." In Archiving 2007: Final Program and Proceedings, May 21-24, 2007, Arlington, VA, edited by Scott A. Stovall, 105-109. Springfield, VA: Society for Imaging Science and Technology, 2007. Tibbo, Helen R., Christopher A. Lee, Gary Marchionini, and Dawne Howard. "VidArch: Preserving Meaning of Digital Video over Time through Creating and Capture of Contextual Documentation." In Archiving 2006: Final Program and Proceedings, May 23-26, 2006, Ottawa, Canada, edited by Stephen Chapman and Scott A. Stovall, 210-15. Springfield, VA: Society for Imaging Science and Technology, 2006. Lee, Christopher A. Taking Context Seriously: A Framework for Contextual Information in Digital Collections. UNC SILS TR-2007-04. October 18, 2007. Never Optimize: Building & Managing a Robust Cyberinfrastructure, History and Theory of Infrastructure: Distilling Lessons for New Scientific Cyberinfrastructures, Ann Arbor, MI, September 28 - October 1, 2006. Hedstrom, Margaret, Christopher A. Lee, Judith S. Olson and Clifford A. Lampe. "'The Old Version Flickers More': Digital Preservation from the User�s Perspective." American Archivist 69 (2006): 159-187. Lee, Cal. Bridging the Gap: Mechanisms for Legitimate Peripheral Participation, MAC [Midwest Archives Conference] Newsletter. January 2003. Hedstrom, Margaret and Christopher A. Lee. "Significant properties of digital objects: definitions, applications, implications." In Proceedings of the DLM-Forum 2002, Barcelona, 6-8 May 2002, 218-227. Luxembourg: Office for Official Publications of the European Communities, 2002. Lee, Cal. Guerilla ERM: Lessons Learned from Some Time in the Trenches. Ohio Archivist. Spring 2001. Lee, Christopher. "Where Have all the Gophers Gone? Why the Web beat Gopher in the Battle for Protocol Mind Share." April 23, 1999 (updated November 4, 2001). PERSIST Steering Committee Meeting. PERSIST Meeting. Abu Dhabi, UAE, March 14, 2016. What do you really care about if you care about digital curation? Alternative Strategies for the Curation of Public Records: How Can States Learn from Each Other? DigCCurr 2007. Chapel Hill, NC, April 18-20, 2007. North Carolina Electronic Commerce Summit, Raleigh, NC, March 13, 2007. "Categories of Digital Preservation Service from Institutional Repositories: Preliminary Thoughts"